I was worried, coming in, that Helen Mirren had decided to only star in Oprah Book Club award winners. Now, I admit that isn’t at all fair, and that I have no evidence to support that fear in the least. But that’s the impression The Hundred-Foot Journey made on me, whether the novel it was based on was actually an Oprah book or not. That film carried a sappy, forced, unrealistic feeling that eventually bores audiences who haven’t bought into the story in advance, something I feared would happen again here, since this movie carries so many surface similarities. 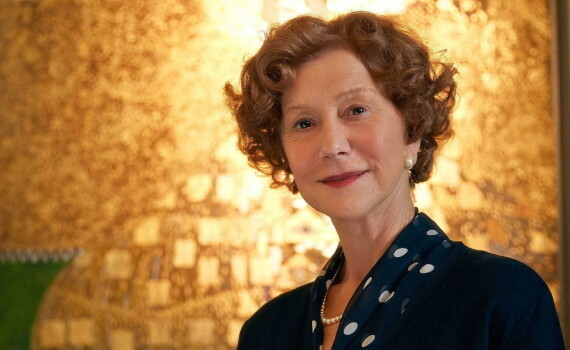 But I am happy to report, despite a few cheesy moments, that Woman in Gold is nothing like the feel-good gushers I was afraid it would copy, becoming instead a dramatic retelling of a true story with enough talent behind it keep it trending in the right direction. During the Nazi occupation and government cooperation of Austria during WWII, many wealthy Jews were forced to flee or to become prisoners in their own homes. Their possessions, their heirlooms, and their art was taken from them, the most famous being the Woman in Gold, a painting by Klimt, a beautiful portrait that would become the Mona Lisa of Austria. Fifty years later, a woman named Maria Altmann began a battle to obtain the Woman in Gold, a painting that had belonged to her family until it was forcefully taken by the Nazis. For years, it had been housed in Austria’s finest museum of art, and had become something of an icon. So, despite the surface appearance of desiring reparations between the Austrian government and Jewish families, the painting would not be given back to Maria Altmann. Hiring a young lawyer and taking the case all the way to the Supreme Court of the United States, Mrs. Altmann refused to give up what was rightfully hers, no matter who or what stood in her way. The true story element of the film was by far the best part, highlighted by flashback scenes of the Nazi era, including the imprisonment of a respected family within their own house while the things inside it were commandeered. It’s a stirring story, complete with daring escapes, the history of Holocaust, the guilt of the Austrian people for following a madman; heavy stuff. And that real content fueled what would become a solid film, one that brought a time period to life while showcasing a very specific event. The portrayal of that event might be be the weakest part of the movie, and even that wasn’t as horrible as I thought it might be. Mirren as an Austrian Jew this time was only slightly believable. Ryan Reynolds as a plucky young lawyer married to Katie Holmes was perhaps less so. And without the flashbacks, the film might have become a bit contrived, despite a director who seemed to be trying his best to orchestrate with a light touch when a heavy hand would have definitely ruined everything. With the story better than the production, I’d still recommend watching Woman in Gold, as it succeeds in telling a fascinating tale and was ultimately better that I expected.